You may have had the same crooked teeth for many years and you may have gotten tired of how they look, but for some reason, you just can’t bring yourself to get braces. Unfortunately, if you knew the benefits of Invisalign, you would know that there is absolutely no reason not to try them. Invisalign braces were designed specifically for those who do not like the look of braces and do not want anyone to know that they are wearing braces. Even if someone does discover that you are wearing Invisalign, the retainer is much more attractive than traditional braces. Invisalign braces are smooth and comfortable. They do not come with wires or brackets, so there is nothing poking your teeth or gums all day long. Wires and brackets can become a hazard when they poke your gums and cause an infection. Your Monroe cosmetic dentist will make sure you are fitted for an Invisalign that is very comfortable. The amount of force that is placed on your teeth by conventional braces can cause them to become damaged, especially if your teeth are decaying. Invisalign is much more gentle, but still places enough force on your teeth to push them into the correct alignment. Unlike with braces, which cannot be removed, one of the benefits of Invisalign is that it can be removed at any time. Just make sure that you wear your Invisalign often enough that it achieves the desired effect. There are many food restrictions placed on traditional braces to reduce the risk that they are damaged. For example, you cannot eat nuts or popcorn. However, there are no restrictions on what you can eat with Invisalign since you can remove the appliance before chowing down. 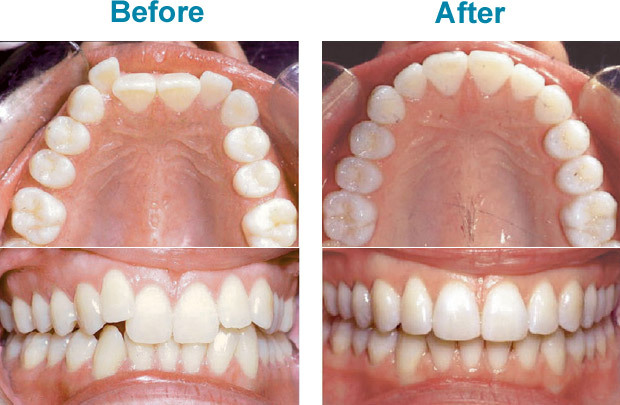 The Invisalign treatment is much shorter than traditional braces. Traditional braces can sometimes take as long as five years, while Invisalign can take as little as one year to achieve the desired results. If you have decided that you finally want to try Invisalign, contact our office to get in contact with a Monroe cosmetic dentist.